Behold: just in time for the last steampunk post, an icon showing me in wig, leather helmet, obligatory steampunk goggles, and raygun. The raygun also has its own icon. On Saturday night I attended the League of Victorian Imagineers Mess Dinner, a huge function full of adults having fun cosplaying and just plain playing. There were hobbyhorse and teacup races* and a bizarre and illogical murder mystery with about 12 corpses. * Teacup races? See this Victorian picture for the idea. 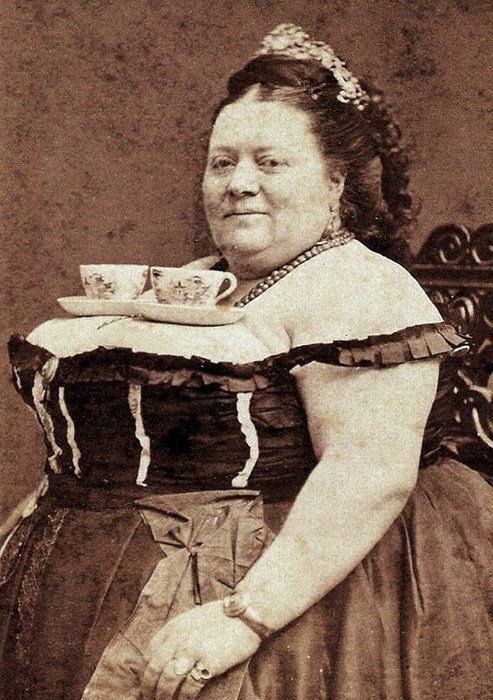 Contestants were selected ladies wearing corsets, but they only had to balance one (empty) cup and saucer. Lady with blinged-up Dalek handbag. Yes, it did say, "EXTERMINATE, EXTERMINATE!" Yesterday it was the Moments in Time fashion parade at the Opera House in which contestants also have to have a story about their persona. I didn't take photos as I knew they wouldn't come out well, but the overall winner was a chap in top hat and goggles - and a wonderfully retro spacesuit. The fire angel with wings he could ratchet out to be HUGE was also wonderful; hey, they all were! Afterwards I had coffee with Katelin from Budapest (now living here). It's not fur, but feathers. Peacock and ostrich? Two time travellers visit from faraway - a couple from Wisconsin whom I kept running into at the tea duelling, dinner, and show. That's it for this year, but it's board games night tonight so that's good.